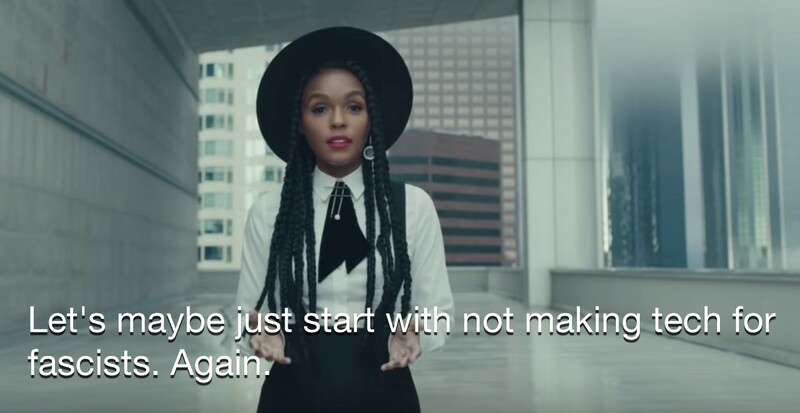 Last month, IBM ran a minute-long ad during the Oscars, titled ‘Let’s Put Smart To Work.’ Backed by a dramatic string score, the spot features a sequence of famous people — singer and actress Janelle Monae, spelling bee champion Akash Vukoti, Open Source software advocate Bruce Perens, Me Too movement founder Tarana Burke, astronaut Buzz Aldrin… and for some reason Arianna Huffington. In the ad, the celebrities We-Are-The-World their way through an ‘open letter to tech’. They start a few vague lines about tech’s faults (Are you working for all of us, or just a few of us?) and end with a laundry list of utopian solutions. We learn for example that AI can help us see the bias in ourselves, that blockchain can help reduce poverty, that IoT can help victims of natural disasters, and that quantum computing can… do something. The ad is meant to read like a call for meaningful change. Albeit in soft terms, IBM seems to be calling out the very industry it represents, speaking aloud a few of the most common critiques — bias, diversity, data rights. Is this a tech company changing its tune? Not likely. Playing the useful repentant is a marketing tactic that has a long history. Indeed, if IBMs ‘Let’s Put Smart To Work' campaign accomplishes anything, it might be to place IBM and big data alongside cigarettes and petrochemicals: products whose executives, facing the music after decades of harm and deception, asked themselves a very particular question: Why be a company that actually changes when you can play one on TV? In the spring of 1999, cigarette manufacturer Phillip Morris launched a $100m advertising campaign urging the public not to use their products. Slickly produced spots, the ads featured groups of 90s teens doing all kinds of 90s teen stuff — hanging out on the stairs, skateboarding, high-fiving, flirting, wearing lots of rings, making handycam movies, all while effortlessly and cooly not smoking. The ads, seen naively, appeared to fly in the face of Phillip Morris’s interests. Why would a company whose business model necessarily included recruiting new customers spend $100m trying to convince kids *not* to smoke? Why, indeed. The American Legacy Foundation answered this question succinctly in a press release: “Philip Morris,” the foundation said, “[is] still trying to hoodwink the public into believing that the industry is reforming itself when, in fact, it is continuing to addict our kids, attack legitimate prevention programs and fight against tobacco regulation at all levels of government.” The ALF release accompanies a study they’d commissioned, which showed that campaigns like ‘Think. Don’t Smoke.’ didn’t stop kids from smoking at all, and in fact encouraged them to become Phillip Morris customers. Later in 1999, the Department of Justice filed a lawsuit against nine cigarette manufacturers including Phillip Morris, charging that they had engaged in a conspiracy to deceive Americans about nicotine addiction and the health impacts of smoking. Seven years later, in the Federal District Court for the District of Columbia Judge Gladys Kessler issued an opinion holding the tobacco companies liable. In no uncertain terms, Kessler said that campaigns like Morris’s ‘Think. Don’t Smoke’ were designed to purposely head off an impending government crackdown. The amount of money spent on these anti-smoking campaigns was shown to be trivial compared to the fortunes spent on lobbying, and on marketing research still targeted to kids. IBM, a company with a particularly troubling ethical history, has a fair amount to distract from these days. At the end of 2017, the company came under fire from its employees after aggressively vying for a contract with ICE to support President Trump’s “extreme vetting” policy. Several of its flagship ‘big data’ endeavors have ended less-than-spectacularly, including a massively botched Australian National Census and a quietly cancelled partnership with a Texas hospital, which had been aimed at ‘at ending cancer, starting with leukemia, in 2013’. Last year, IBM’s facial recognition algorithms — trained on nonconsensual data gleaned from NYPD surveillance cameras — were shown to have pronounced bias against black faces. IBM researchers then trained a ‘better’ version of the algorithm on a brand new training set- one which it had scraped from Flickr without asking for users’ permission. In case that all weren’t enough, the company is embroiled in a federal lawsuit brought by former employees who accuse IBM of age discrimination. In 2010, Chevron had it’s own set of problems: A $28B class action lawsuit in Ecuador, oil spills in Angola, pressure from state and federal governments to reduce emissions, and a generally souring attitude from the public towards the pertrochemical industry. Partnering with ad agency McGarryBowen, Chevron tried the born again brand trick with a big-spend marketing campaign called ‘We Agree’. 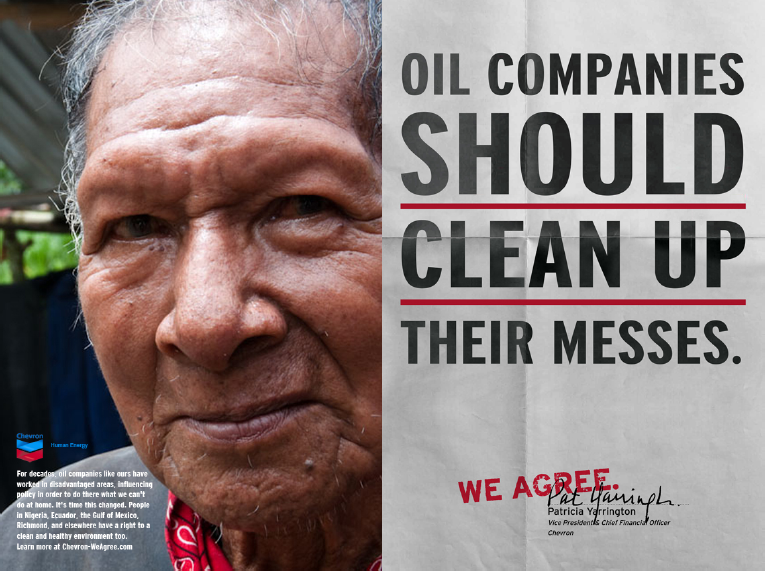 The ads presented split-screen conversations between oil company representatives and ‘real people’ who voiced concerns about impacts on the environment and on communities. Each spot featured a ‘consensus statement’ — a sentence that both Chevron and normal everyday people could agree on. Oil companies should support their communities. Oil companies should put their profits to good use. It’s time oil companies get behind the development of renewable energy. The central message of the Chevron ads was the same as IBM’s Oscars spot: Sure, everything is a mess. But you can trust us to fix it. We can expect IBM’s Oscars ad to mark the beginning of a mudslide of campaigns designed to convince us (and the government) that tech companies can be trusted to fix the mess they’ve made. With Facebook bracing for a record-setting FTC fine, Amazon reeling from grassroots backlash to its expansion plans, and Google confronting growing discontent amongst its employees, they’ll all be trying to get us to focus on something else, to try to build a narrative where they are the fixers, not the breakers. First, to recognize the ads for what they are: misdirections. To understand that these ads appear not when a company is filled with goodwill, but when they are fighting campaigns again impending fines and legislation. To see clearly that big tech doesn’t truly want to change their tune; they just don’t want to face the music. Second, to take vaguely worded advertising speak of these ‘open letters’ and to turn it around, to meet vague promises with real demands, to call on the companies to address real issues which are affecting real people right now. And to do all of this loudly — not just by writing Medium over-earnest posts but by crashing conferences, faking websites, staging job actions, exposing inequalities and amplifying the work of activists and advocates who are doing the real day-to-day work of change.